On Wednesday evening April 17th, East Brandywine Fire Company volunteers participated in vehicle rescue training. Twenty-five personnel attended the training in which a two car head-on collision was simulated. 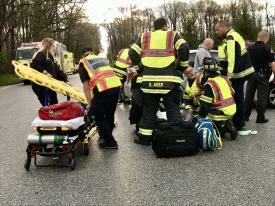 On Monday morning April 15th at 7:06am East Brandywine Fire Company was dispatched along with MICU 46, Ambulance 144 and Medic 93-2 and 93-3 to East Reeceville Road & Bollinger Road for the auto accident with injuries involving a dump truck and passenger vehicle. On Saturday April 13th at 5:15am East Brandywine Fire Company volunteers responded to Uwchlan Township to assist the Lionville Fire Company on a building fire. 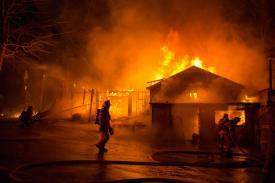 The fire occurred in the 500 block of West Uwchlan Avenue at C and S Repair Center. Initial calls to the 911 Center reported flames coming from the whole building. On Wednesday April 3rd as members were on station still cleaning equipment and getting our trucks back together from the 2nd alarm fire on Bolero Dr we were dispatched for another house fire this time in Honey Brook Township on Hunters Run Rd. Initially Station 33 was dispatched for a vehicle fire but the call was upgraded quickly to a house due to the fire extended to an attached garage. On Wednesday afternoon April 3rd East Brandywine Fire Company was dispatched to Bolero Drive in Applecross for the reported house fire. 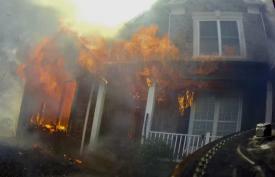 Initial reports indicated flames from the front of the house. On Tuesday April 2nd East Brandywine Fire Company was dispatched along with numerous other companies to assist West Bradford Fire Company on a reported house fire on Parkview Ln in West Bradford. Initial reports indicated a fire in the kitchen and the house had been evacuated. Engines 49-5 and 49-2 made the response. 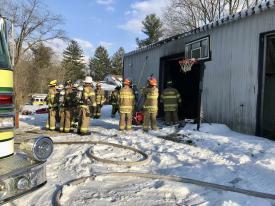 On Thursday March 7th East Brandywine Fire Company volunteers responded to a reported garage fire in Wallace Township. 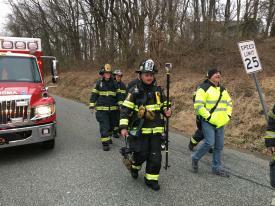 Engine 49-5 and Ladder 49 made the response to assist the Glen Moore Fire Company. First arriving units reported a 30'x50' detached garage with heavy smoke showing. 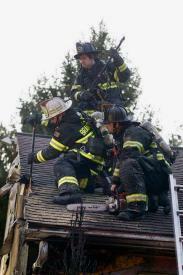 Following the report Chief 48 requested the working fire dispatch.